Taapsee Pannu and Bhumi Pednekar's 'Saand Ki Aankh' posters are out. The actors play 'shooter dadis' in Anurag Kashyap film. 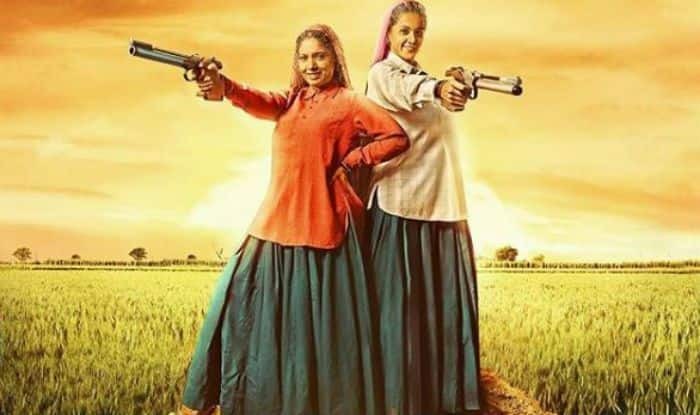 The first look of Taapsee Pannu and Bhumi Pednekar as ‘shooter dadis’ in Saand Ki Aankh are out. The actors have impeccably got into the skin of their characters in the first look. Saand Ki Aankh is a biopic based on the life of sharpshooters Chandro Tomar and her sister-in-law Prakashi Tomar. Dressed in a loose shirt, greyish-green ghagra with rifles in hand, Taapsee and Bhumi are seen donning a never-seen-before look as 60-year-old women. If we closely see them, they are into the character of Chandro Tomar and Prakashi Tomar. Their wrinkled face, grey hair and perfect attitude is a visual delight for us. The first look of the film was shared by Anurag Kashyap, Taapsee Pannu and Bhumi Padnekar. Anurag Kashyap is the producer and Tushar Hiranandani is the director of Saand Ki Aankh. The film will showcase the journey of the oldest shooters in the world. “They may be old, but their aim is sure-shot gold! Here’s the first look poster. #SaandKiAankhThisDiwali”. Originally, the film was supposed to be called ‘Womaniya’, but there was some conflict over the title with Pritish Nandy and hence, the makers decided to change the name to Saand Ki Aankh. The filming began on 10 February 2019 in Baghpat, Uttar Pradesh and later some parts were filmed in Hastinapur and Mawana. Saand Ki Aankh is slated to release on Diwali 2019.